In retail marketing (which is what ECommerce product sales IS), the general rule of thumb is that you need at least 20% profit to survive (barely) and at least 30 to 35% to sustain and grow. More would be much better, of course. When those profit margins just aren’t there, the first thing people do is blame the wholesaler. They MUST be fake. They MUST be overcharging. Like villagers with torches and pitchforks, they storm the walls of the wholesale suppliers and look for the monster they’re sure is lurking within. Only there is no monster. Legitimate wholesalers offer legitimate profit margins. Now, don’t get me wrong here. If you read Day 1 of this series (which you did, didn’t you? Please tell me you did…) you’ll know that fake wholesalers and bad wholesale information abounds on the interwebs. The Markesharks (read Day 1, will ya??) make sure of that. However, if you get your wholesale information and suppliers from a REAL Wholesale Directory (like your friendly neighborhood WorldwideBrands.com, for example…nudge nudge!) then your wholesale suppliers are absolutely 100% REAL. So why do you sometimes see profit margins that are so low that you couldn’t slide a piece of paper under them if you greased it with glycerin? IT’S NOT THE PROFIT MARGIN. IT’S THE VENUE. With real wholesalers, the profit margins are there and they are HEALTHY! It’s WHERE you sell online that’s the problem. I know a lot of people who read our emails sell on Amazon and eBay (which I like to collectively refer to as AmaBay, just because when it comes to this issue there isn’t any difference between the two). Still, knowing that, I’m going to risk bending some noses out of joint and simply telling you what’s really going on when you sell on AmaBay. So here goes. When you sell on AmaBay, two things are happening. You’re selling in a BARGAIN-HUNTERS’ MARKETPLACE. eBay and Amazon both represent themselves that way; you know they do. The WORST PLACE you can put a retail business is squarely in the path of the most bargain-hunting group of consumers on the internet. No, not EVERYBODY is bargain-hunting on AmaBay. But MOST people ARE, and that’s not a good business model for a home-based EBiz. Ask anybody who has a business degree; they’ll tell you. The MAJORITY of your competition on AmaBay these days ARE large wholesale companies AND direct manufacturers. You’re COMPETING on PRICE against many sellers you can NEVER BEAT on price. Yes, it’s true, and I know many people don’t want to hear that. However, before anybody lights a torch and grabs a pitchfork, let me explain what’s happened to AmaBay in the last few years. In the earlier years of eBay, up to about 2009, eBay was a place where you could make much more profit than you can today. It still wasn’t a gold mine by any means, because you were still dealing with bargain hunters and also with the ever-frustrating “Sort By Lowest Price” link that gives all eBay sellers that familiar “the monster is standing right behind me, isn’t he?” chill down their spines, but it WAS better than it is now. The difference is a program that eBay started in about 2009. When their former CEO, Meg Whitman, left the company (in about 2009), the new management decided they weren’t making enough money. (Although if you’ve been inside the eBay headquarters in San Jose, like I have, they certainly don’t look like they’re hurting for cash). So how to make more money, they wondered? I can imagine the meeting in the boardroom (but I won’t use real names). I imagine that the board shouted “No!”, and promptly shut all those programs down forever (which they actually did). I imagine that the board promptly hollered “No!”, then created more regulations, raised fees, made it even tougher to appeal bad feedback, made the “Sort By Lowest Price” link even bigger (all of which they actually did), and then quietly had Tibbet and Johnson escorted from the room and fired. I imagine that the board did a collective steepling of their fingers and gave a Monty Burns “Eeeeexxxellleennntt!” (it’s a Simpson’s reference…you get it, right?) and then promptly did just that (which, yes, they actually did). SO, eBay USED to be a place where home-based business owners got together and sold things to people who wanted to buy them. NOW, eBay is a place where many giant wholesale and manufacturing companies get together behind hidden identities, gleefully sneak up on and steamroll over all the unsuspecting home-based business owners, and sell things to people who want to buy them at low, low prices that no home-based business owner can ever beat. When home-based business owners find themselves selling certain products in competition with these big companies on eBay, they generally see profit margins ranging from about 4% to about 11%. A business needs to make at least 20% to be sustainable, and 35 to 40% to grow, as I said. If you’ve been frustrated with selling on eBay because your products don’t seem to have any profit margins against your competition, I’ll bet all of this explains a lot. Sorry for hurling a stink-bomb into the rose garden, but SOMEBODY had to tell you. While eBay has spent the last several years trying to imitate Amazon, Amazon has just rolled happily along being Amazon and not caring who knows it. Amazon has ALWAYS favored large wholesalers and manufacturing companies selling DIRECTLY on their platforms. While the Markesharks take great delight in telling you to spend all your waking hours doing silly things like “retail arbitrage” and trying desperately to import products from China (which you should NOT be trying to do as a home-based business), they know that stuff won’t get you where you want to go. So when you AmaBay as a home-based business, you’ll always be playing bumper-cars in the dark, crashing willy-nilly (yes, I said that) into other sellers that you don’t know are actually large wholesale and manufacturing companies who are perfectly happy to make a 4% profit margin, because that’s where they LIVE. Wholesalers and Manufacturers are USED to low margins, because they do such huge-volume business. The absolute best way to avoid this is to sell on your own web site, where the people who search for products are using SEARCH ENGINES instead of simply going straight to AmaBay and bargain hunting all day long. Those who DON’T go directly to AmaBay and bargain hunt are willing to spend more money for what they want, AND you won’t crash into wholesalers and manufacturers in the dark all the time. EITHER WAY, whether you AmaBay or sell on your own site, your best defense is a good offense (to screw up a perfectly good metaphor). And your best OFFENSE is REAL wholesale suppliers; not all that junk that everybody else puts out. When you work with REAL wholesalers AND you carefully research the products you sell and their profit margins, you’ll do just fine. But whatever you do, please don’t blame the wholesalers. Not the real ones, anyway. It isn’t their fault. Having been in this business for 24 years, I’ve seen a LOT of people who completely misunderstand wholesale suppliers and profit margins. Wholesale suppliers who are legitimate are a critical part of YOUR business success. The more you understand about them, the better off you are. Understanding that when you work with real wholesalers, profit margin is a function of COMPETITION, not wholesalers, is extremely important. The LEGITIMATE wholesale companies out there DO provide REALLY good profit margins. You just have to be careful on the bumper-car track. We research, verify and continuously update EVERY wholesale company we list. 2. We list ONLY LEGITIMATE wholesalers who have ALREADY AGREED to work with Home-based business owners. 3. When you contact our wholesalers, they KNOW WHO WE ARE and are happy to do business with you. 4. We charge a ONE TIME, LIFETIME ownership fee. Pay once, and you’re done. NO hidden monthly or annual fees. 5. We NEVER give, share or sell your personal information with ANYONE ELSE, for ANY reason. 6. We currently list more than EIGHT THOUSAND REAL wholesalers who represent more than FIFTEEN MILLION wholesale products you can sell online. That simply doesn’t exist ANYWHERE else. We are the ONLY one of our kind. We know that because our Team is constantly checking out every online operation that calls itself a “wholesale directory”, and we have NEVER found another 100% legitimate company in this business. WorldwideBrands.com is the ORIGINAL and longest-lived online EBiz Wholesale Directory on the planet. It is the INDUSTRY STANDARD that thousands upon thousands of successful home-Based ECommerce Business Owners have started their businesses with. If you’re a Worldwide Brands Member, you already know all this and you’re already working with legit wholesale suppliers who provide you with good profit margins. If you’re not, you really should be. It’s a whole world of difference that’ll change your business dramatically. 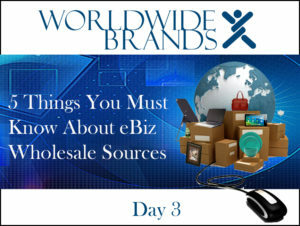 Next, “5 things you MUST know about EBiz Wholesale Sources”, Day 4: DOES YOUR SUPPLIER DELIVER QUICKLY ENOUGH? Read it here! This entry was posted on Wednesday, July 19th, 2017 at 11:00 am	and is filed under Online Business Advice, What's New. You can follow any responses to this entry through the RSS 2.0 feed. You can leave a response, or trackback from your own site.